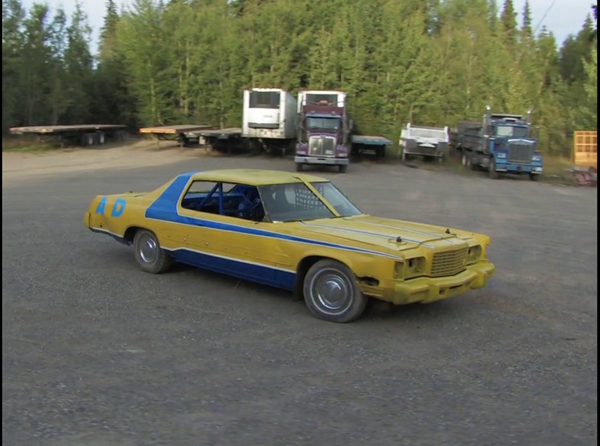 Hit 2 Pass is a documentary which takes at its focus not just its subject (a demolition derby race – you have to hit to pass your opponent – and the community surrounding it), but the film grammar required to tell its story. Beginning with a surreal black & white bit with some kind of Jerry Lewis or Professor Pluggy-inspired MC that announces that the film will be presented in 4:3 and then pointing out that the image the viewer is watching is, in fact, a 4:3 image, the film explains its subject and how it will explore it. From the start, we’re conditioned to interrogate every image not just for what it’s showing, but also for what it’s saying about the people doing the shooting. Most of the early parts of the film are given over to the building of the car that will eventually participate in the competition. The camera and the cameraman traipse about junk yards, bobbing and weaving, struggling to keep up with its subjects. A key moment happens when a character squeezes in between two cars and the cameraman can’t do it so he has to walk around the car. The film constantly has moments like this: two crew members play around with drone cameras, the look of joy on their face completely infectious; a child drops a camera, apologizes and then films through binoculars; the crew passes each other the camera so they can get a new angle. The building of the car and the race are rites of the community and they help to create deeper bonds for the father and son team building the race car. Similarly, the communal spirit of Kurt Walker’s film extends to the filmmaking. This is an opportunity for friends to get together, play around and make a movie. Walker gives the mise en scene over to his friends – everyone gets a turn to leave an imprint on the film. Still, Hit 2 Pass‘s most crucial gambit is the key interview with an aboriginal who relates his relationship to his heritage, his homeland, and the narrative tradition of his people. As he takes breaks from speaking by smoking, an off-screen voice asks questions, digging deeper, bringing up stories from the past. It’s here that the film changes before our eyes. Or, rather, brings into focus the actual meaning of the earlier scenes of scrap yards, race tracks and empty fields. 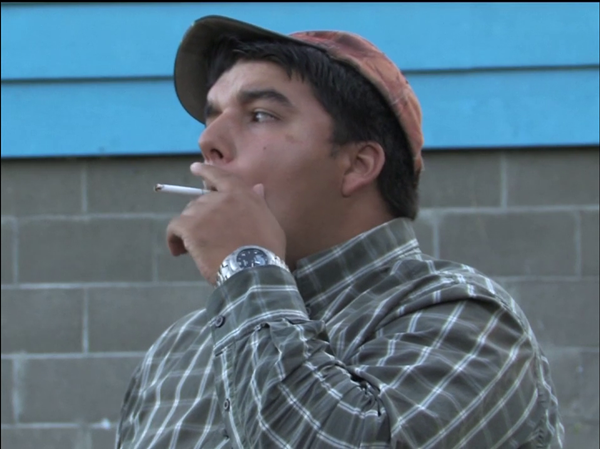 Earlier, on-screen text stated that the film was shot on location in Prince George, British Columbia, and after the interview it begins to make more sense why that statement is crucial. As the film gives over to long, ambient takes of graffiti, passing cars and railroad tracks, it becomes clear that the land is what houses everything – the traditions of the aboriginal people, Sunday video games, a group of young bros making a movie together. Everyone in front of the camera and everyone behind it are bringing to life new traditions with each new image. Hit 2 Pass plays Friday, September 25th only at the Northwest Film Forum, as part of the Local Sightings Film Festival.